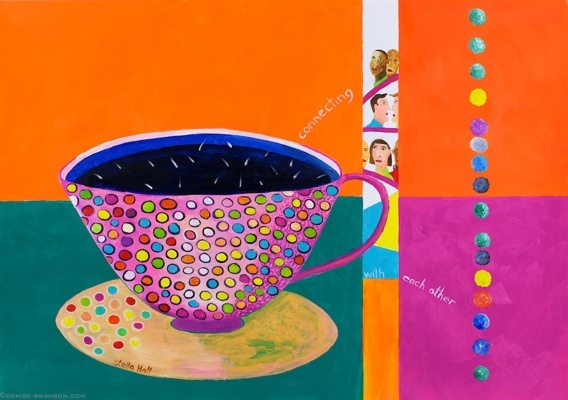 Moments that Matter : Trophy Cups is a collaboration between WE PLAY EXPO, Harris Museum & Art Gallery and artists Lubaina Himid, Rebecca Chesney, Susan Walsh and Denise Swanson. On the 25th October 2012 at 1pm in the Watercolour Gallery, the Harris Museum & Art Gallery hosted a lunchtime talk by Lubaina Himid in which she discussed her latest archive intervention and curatorial project. Thousands of people in the North West have been directly involved in sporting and creative projects connected with the London 2012 Olympics. The impact of this participation was often very signicant and the memories will last for years for many people. This archive project by international artist Lubaina Himid, Professor of Contemporary Art at UCLan, visualises 45 of their stories in a series called Moments that Matter. Each of the 45 Trophy Cups painted on paper is individually made using the unique words and descriptions shared by participants with the artist. 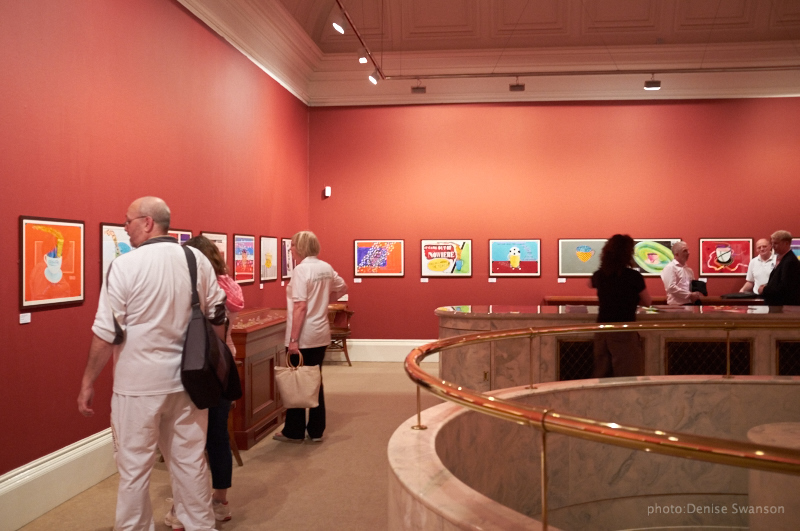 These paintings were shown along with two small artworks around creativity and sport in addition to a display of working drawings and research material. 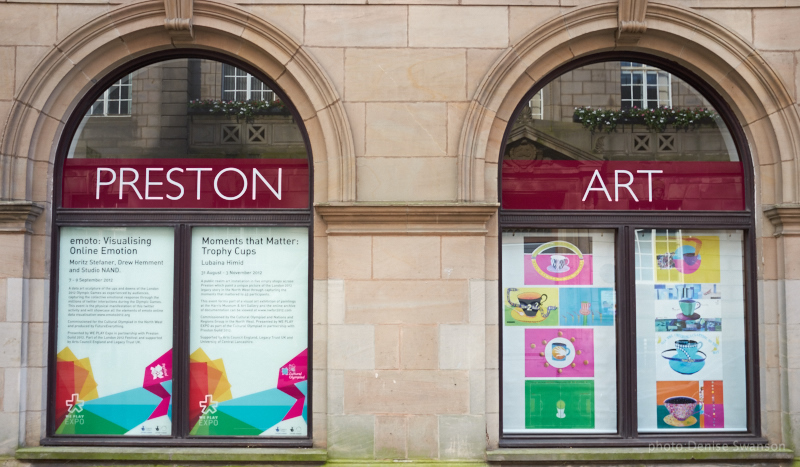 These in turn were seen alongside contemporary maps by Susan Walsh and Rebecca Chesney depicting hidden treasures and untold stories from across Preston. The Moments that Matter banners were displayed in the windows of shops across the city during the celebrations. is an attempt to give recognition to the varied histories and skills of the many homeless people who find themselves continually sleeping rough and to acknowledge them as the multi faceted and knowledgeable people they can be. Memory and identity are important factors within the work of Susan Walsh which ranges from installations to photography and moving image. It is both gallery and site based and incorporates an on-going investigation into basic-needs survival, using the device of either temporary memorial or mini museum. The English Heritage Blue Plaques we see in many cities, citing the skills and achievements of well-known important men and women (X Lived Here) make visible, with pride, the efforts made by select members of society, both now and throughout history. Based on this she has created a series of ‘Alternative’ Blue Plaques to be placed in specific locations in Preston. These plaques are intended to show some small acknowledgment of the way many homeless people exist and survive without permanent shelter in 2012. The temporary shelter locations selected for this project can be found on the Significant Other map – each one highlighted with a number. These sites are sometimes in less desirable areas, sometimes well hidden, occasionally surprising, rarely comfortable or warm, and often in the public gaze of the busy high street. Preston-based artist Rebecca Chesney explores and reveals changing environments and the impact of human activity, creating artworks that not only capture a sense of wonder in the natural world but also the inescapable struggle between survival and death. One ongoing strand of her work started in 2006 when she conducted a weed survey of Preston city centre that revealed over 70 different species of plant within the urban environment. Exploring the ecology of the city and researching stories and myths behind the plants Rebecca has extended this project to create a new map for Preston that reveals the hidden fauna of the familiar. Recent projects have included an Arts Council funded trip to Japan to research native and non-native species of dandelion and a year-long residency at Yorkshire Sculpture Park researching the bees and plants of the Bretton Estate. Earlier this year Rebecca was commissioned by Landlife to create two acres of meadow for Everton Park in Liverpool. Divided into two square plots, one acre is made entirely of yellow flowering plants and one acre is of entirely blue flowering plants. Denise Swanson has photographed each Moments that Matter painting and co-designed the banners which were seen across the city. She is a photographer, print-maker and co-founder of Oxheys Mill Studios in Preston. She is well-known for her abstract photographs of wild plants through which she aims to reveal the structure and order of the natural world. Commissioned by Cultural Olympiad and Nations and Regions Group, North West.Presented by WE PLAY EXPO as part of Cultural Olympiad in partnership with Preston Guild 2012. Supported by Arts Council England, Legacy Trust UK and University of Central Lancashire.